“Journalism is history on the run.” So said Thomas Griffith, former senior editor at Time magazine. But while journalists like me describe the changes shaping our history, there are times when we cannot help but ask ourselves how history has also changed us. I was reminded of this when I came to London and Sweden last month to meet European editors as part of a trip organised by Panos London. It gave me the chance to meet journalists from different parts of the world – Africa, Asia and Europe – and discuss how the issues that have defined the last five years – economic collapse, the rise of social media, resistance to multiculturalism – have also affected the way journalists work. A Spanish journalist told to us how the economic turbulence in Spain has not only decreased employment opportunities for journalists in general, but also reduced the scope of issues that citizens are concerned about. The prevalent sentiment is “we have too many problems here already in our country”, hence the desire to learn more about issues affecting other people and other nations has lessened. Consequently, he said, there is now a narrow window for reporting on development issues in other parts of the world. 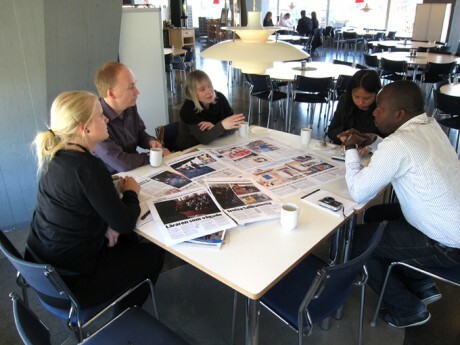 Journalists from Sweden and Poland, however, where the economies are stable and growing, said editors want more diversity in the issues they tackle. We met national editors in Sweden who welcomed stories about AIDS and birth rates, religion and sexual orientation and environmental activists from other countries. They want to broaden their coverage – and are actually willing to pay for it. There is one way, however, in which journalism can still be global, dynamic and comprehensive, despite economic considerations, and that is through social media. The growth of social media has helped established news organisations such as the Guardian, which we visited, make it possible for voices from other parts of the world to be heard amid the economic crunch. I was able to talk to Jaz Cummins, community coordinator for the Guardian’s Global Development team, about this. Cummins said engaging people through Twitter and Facebook helped the Guardian contextualise local issues better – they can get opinions from people who have personal knowledge and expertise on the subjects at hand. But that is not to say that old-fashioned news-gathering and storytelling processes such as research and personal interviews have become obsolete. On the contrary, the use of social media complements them. Social media helps generate real-time reactions and opinions from people in local communities – and these help journalists recognise different perspectives on an issue and identify sources for stories. When I got back to the Philippines, I scoured social media for local concerns that I could do stories on. But I knew that I would not rely on virtual conversations alone. For each story I will personally meet the people involved and explore their environs. Talking to editors in Sweden only affirmed that good, catchy stories require authentic colour and human experience – elements that can only be truly captured by personally talking to the subjects of a story and seeing issues unravel through their eyes. Meeting journalists from different countries and hearing their own stories showed me how journalism is answering the call of changing times. Hello and thank you Purlple for this article. I wonder why when media managers explain why they are closing foreign offices, they always talk about economic reasons while it seems that social media both expland the possibilities and reduce the costs of covering international news. Also, I wonder if there are reports documenting the loss of interest and explanation of the nationalisation/localisation of news production during economic crisis. Another important phenomenon is the amount of data social media are producing. How do media organize to collect, analyse and contextualise such big amounts of data ? I hope the cost reduction of closing foreign offices is compensated by investements in this data field. I think we journalists can also join in a social media and exchange information, discuss and reflect together on the facts and events around the world. I believe in communication as a tool for social trabsformação and I want to be able to give good news for people! (sorry for any mistakes in this short text, I used the google translator, why not write well in English).